A young man who died more than 100 years ago at the age of 28 sowed the seeds for the new Jacob Hoover Cowen Herbarium in downtown Hotchkiss. Carolyn Sue Savage Hall, a longtime Hotchkiss resident, brought her lifelong interest in botany to fruition this summer with the grand opening of a professional quality herbarium in a room at the Hotchkiss-Crawford Historical Museum on south 2nd Street. Carolyn Sue has pursued an increasing devotion to plants since she was a child. From a child collector to an amateur botanist to a credentialed collector, her love for plants has blossomed over the years to culminate in this remarkable achievement. Mary Hotchkiss Farmer, a dear friend of Carolyn Sue’s, introduced her to the story of her ancestor Jacob Hoover Cowen. 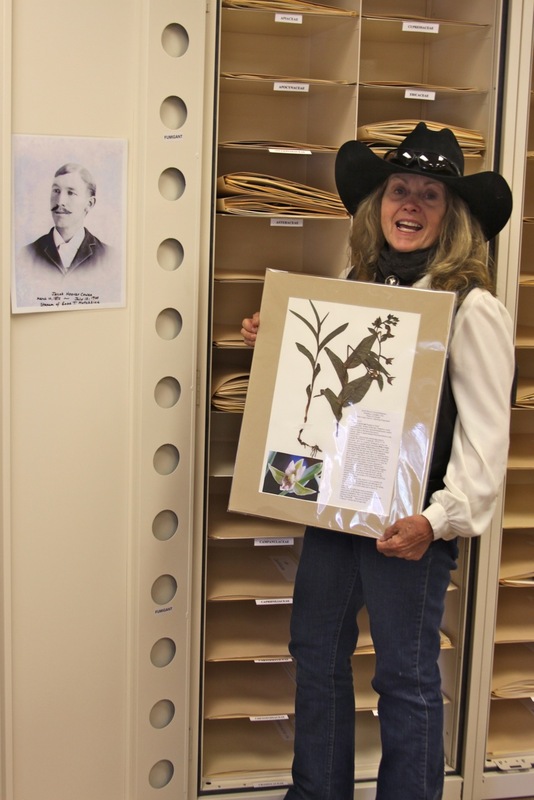 After delving into his story, reading his letters and his diary, Carolyn Sue knew that he was the person to honor with the name of this herbarium. He was so learned and knowledgeable about Colorado plants, and died so young and relatively unrecognized, she said, that she felt compelled to honor him. Jacob was the stepson of Enos Hotchkiss, and moved from Powderhorn with his mother and her new husband to the North Fork Valley in 1882. He graduated high school in Delta, and attended Colorado Agricultural College (now Colorado State University) in Fort Collins. After graduating at the head of his class with a degree in botany, Jacob taught botany and horticulture at the college, and with two other men founded the herbarium there. He pursued graduate studies in botany at Cornell University and published a book, The Geography of the Apple in North America. 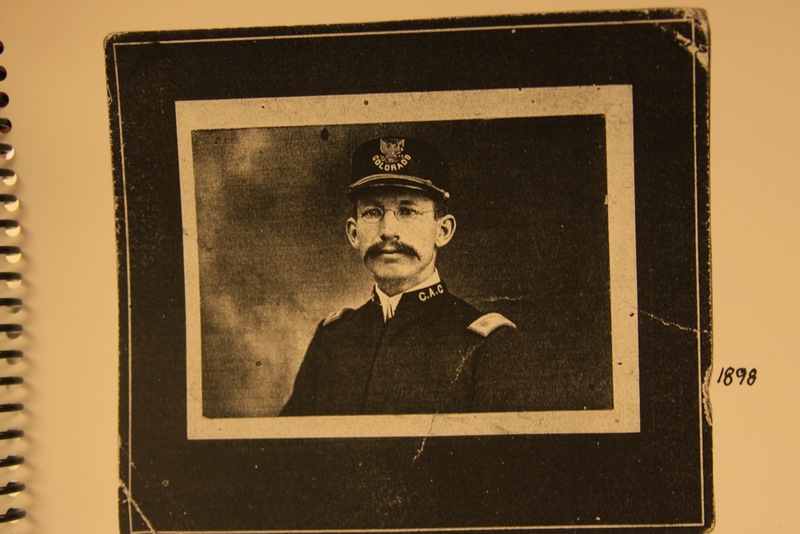 After accepting a position as chair of horticulture and botany at his alma mater back in Fort Collins, Jacob became critically ill, and died on July 12, 1900, of peritonitis after a ruptured appendix. At just 28, he was regarded by professionals as a leading expert in Colorado botany at the time. Busted by a state trooper for digging up spider lilies on a roadside in Arkansas in 1970, Carolyn Sue escaped trouble because she had permission from the landowner, and recounting the escapade makes us both laugh. Our conversation takes place in the Herbarium on a July afternoon. She downplays her importance in this achievement and gives credit to the Lord, and to those who helped her along her way. An insert in her program for the Herbarium opening acknowledged dozens of people, from friends and teachers to people who’ve let her collect on their land. Including me! I met Carolyn Sue when she heard that I have a rare plant in my old-growth juniper forest. She came out to collect a few specimens during a banner year for Thelypodiopsis juniperorum, the juniper tumble mustard. I’ve followed her collection obsession with interest since then, and was pleased to be invited to the Herbarium opening. An open air ceremony on June 23 dedicated the Herbarium, with all manner of special features, including plantable name tags and program inserts permeated with flower seeds, a biography of Cowen read by his relative Mary Hotchkiss Farmer, cupcakes with edible flower decorations, and gigantic chocolate-covered strawberries. Carolyn Sue delivered a brief history of the Herbarium, and then in lieu of cutting a ribbon, she and her assistant opened a pretty box and out flew hundreds of painted lady butterflies. A hushed “ahhhhh!” rose from the audience as the lovely pollinators rose into the tent and fluttered their way out into the sky. One landed on the white hair of an elderly guest and stayed quite awhile. Another landed on the spray of flowers that adorned our table. The thoughtful, natural details Carolyn Sue brought to this ceremony bespeak the care she has devoted to the entire project. All pressed and dried plant specimens in the Herbarium are preserved on archival mounts and carefully stored and ordered by family in a steel cabinet. On display for sale at the opening, and available still, are many professional quality mounted botanical specimens, including photos of the plant in situ. The Museum is open from 1-4 p.m. on Friday, Saturday, and Sunday, and can be opened by appointment for anyone with a special interest in looking through the plant collection in the Herbarium. She tells with excitement how she found one plant, the arctic gentian, that is not supposed to occur here. 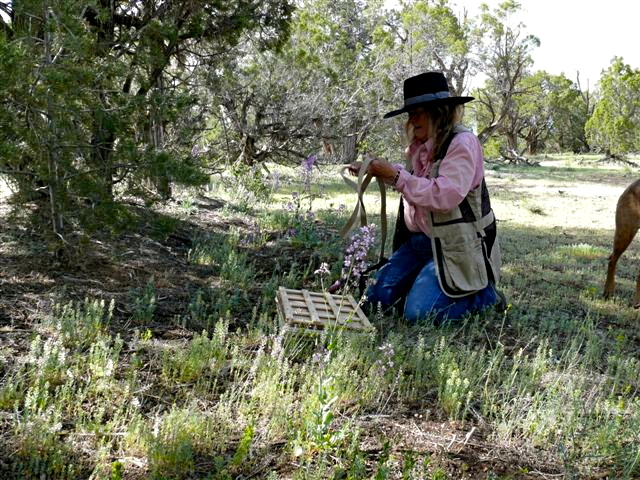 While running cattle with her husband up in the mountains, she noticed the plant and stopped to examine it more closely. ‘Something lost behind the Ranges. but His whisper came to me! Over the years, though, she translated her youthful enthusiasm into a scientific pursuit, which began in earnest in 2006 when she collected her first specimen. She knew she needed permission to collect on public land, and needed verification of her specimens, so she contacted CSU in Fort Collins. She began collecting four specimens of each species: one for the National Forest Service office in Paonia, one for the Collbran office, one for CSU, and one for herself. And then, in 2007, up in the mountains with her current husband Rod and her copy of Jepson’s manual, she read the inscription, and she heard the voice of the Lord again, and it all became clear to her: this was, indeed, what she was supposed to be doing. Since that time she has devoted every spare minute to collecting, identifying, and preserving the plants of Delta County. A self-educated botanist, Carolyn Sue received high praise and high marks in an online Plant Diversity course through Santa Barbara City College in 2007. She later enrolled in the Master Naturalist program at Gore Range Natural Science School in Avon, where she found she had so much self-acquired knowledge it wasn’t as much of a challenge as she’d anticipated. Her dedication runs so deep that she owns an electronic microscope equipped with photographic capability. Continuing to deepen her education, she intends to publish next year the Floral Identification for Delta County and Its Adjoining Watersheds. Before Carolyn Sue’s passion for botany led her to collect more than 300 species of plants in about forty plant families, the state collection had only 560 specimens collected from Delta County. After amassing this large collection of Delta County plant specimens, she conceived the idea of the Herbarium. In the bright room on the south side of the museum where the collection resides, I ask her to show me a few examples, and from the open cabinet she pulls a couple of manilla folders. It’s one I recognize, white prince’s plume. It blooms in the dobes every fifteen years or so, by the millions, when conditions are just exactly right. The rest of the time you never see it. We look at a few more pages of the collection. 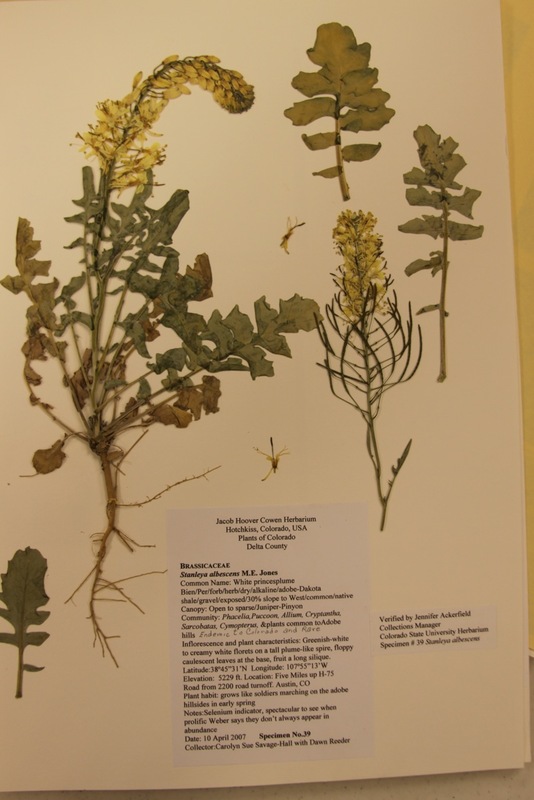 To view the plant collection in the Jacob Hoover Cowen Herbarium by appointment you can call the Hotchkiss-Crawford Historical Museum at 970.872-3780, or stop by at the corner of 2nd Street and Hotchkiss Avenue in downtown Hotchkiss Friday-Sunday from 1-4 p.m.